Bone Broth Recipe | food.heal.thrive. Bone broth is easy to make at home, with no formal recipe. You could just add chicken bones to a pot of water, simmer it for a few hours, and you’d get pretty good bone broth. I make mine outside in a huge stainless steel pot my mother in law gave me a few years ago. I mean, it’s HUGE. 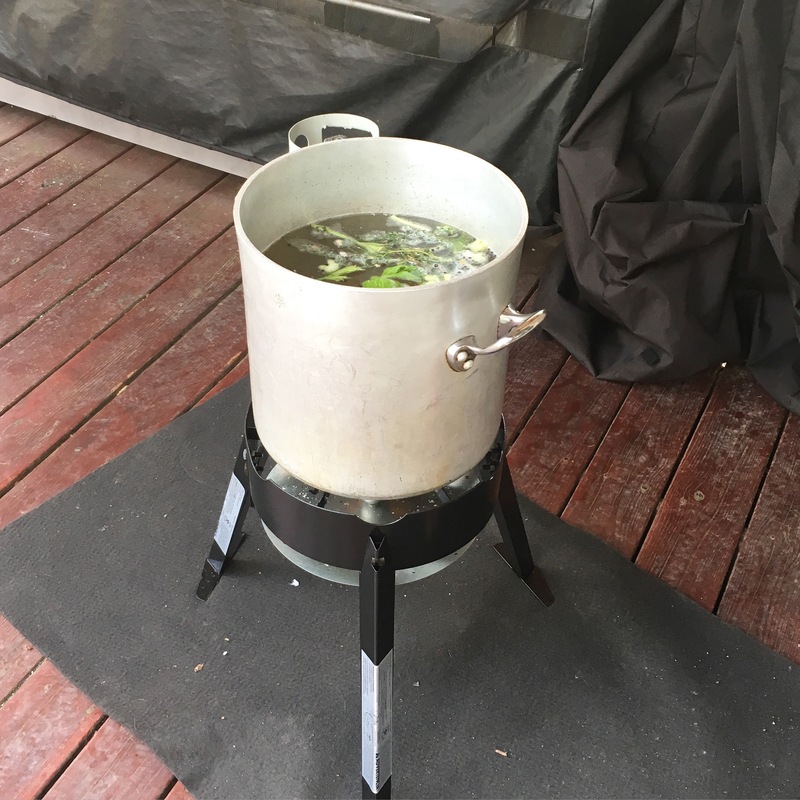 My husband bought me a propane kit used for frying turkeys and I use it for making broth every 3 or 4 weeks. The bones I use vary each time, depending what I have on hand and what I found at the market. One thing I strongly suggest is to use high quality bones for best results. When I roast the pasture raised chickens I buy, after we’ve eaten the meat, I keep the carcass in the freezer. I also buy pork bones from Happy Critters Ranch and chicken feet from GrassFat Farms. Chicken feet make the best broth. Ever! You can mix all the bones if you want but flavor wise, I prefer to mix chicken and pork bones together and keep beef bones by themselves. Beef has a depth of flavor I prefer to use for specific dishes that include beef and lamb. You can use grass-fed beef bones in water like what I describe below, but for a better beef flavor, roast the beef bones beforehand at 400ºF for one hour. Always use filtered water. As the broth simmers, water will evaporate. Any contaminants in the water will then concentrate. Don’t use salt in your broth. When you add salt at the beginning of the process, it will concentrate and give you a salty version of broth. It’s better to add salt to the dish you’ll use the broth for. I add to mine black peppercorns, slices of fresh ginger and turmeric (for their health benefits), carrots, celery, onions, fresh parsley and fresh thyme. When is the Broth Done? I take note of the water level when I start the broth. Once it reaches the halfway point, I stop the process. Once the broth has reached the mid-way point (this can take a few hours, or up to 12 hours with a huge pot like mine), turn off the heat and let it cool. Don’t try to drain your broth if it’s too hot! I will even store my broth overnight in the fridge to cool it completely. This step also helps with bringing the fat to the surface and it’s easier to just scoop it up and discard. It’s not necessary but I prefer to de-fat my broth before storing it. A sign of good broth is the gel. If your broth becomes like gelatin, throw your hands in the air and say victory! If your broth doesn’t gel, no worries, it’s still good to use but you’ll know to use more bones next time. If your broth has gelled, after removing the fat, heat it up lightly – just barely – so it can flow freely. Store in Mason jars and freeze. Don’t fill the jar to the top or else it will crack. What can I do with the Broth? Now you have broth. Plenty of it. What can you do with it? You can drink it just like that, adding a pinch of salt. It’s comforting, especially if you’re fighting a cold. You can use it to cook rice, or de-glaze a pan after cooking steak or chicken to make a sauce, and of course, you can make soups and stews. There you go. Broth is easy. Keep your bones in the freezer until you have plenty, or buy bones at the farmers market from animals that were raised properly.